Secretary of State and former CIA Director Mike Pompeo said during a hearing before the House Foreign Affairs Committee today that he does not believe there is a deep state in the CIA, the State Department or the Department of Justice, which is the same as a mob boss saying he doesn’t believe there is organized crime in the Mafia. California Rep. Ted Lieu, himself a virulent Russiagater and aggressive defender of the US intelligence community, asked Pompeo if he believed there was a “Criminal Deep State” at the State Department in reference to a recent tweet by America’s reality TV president. 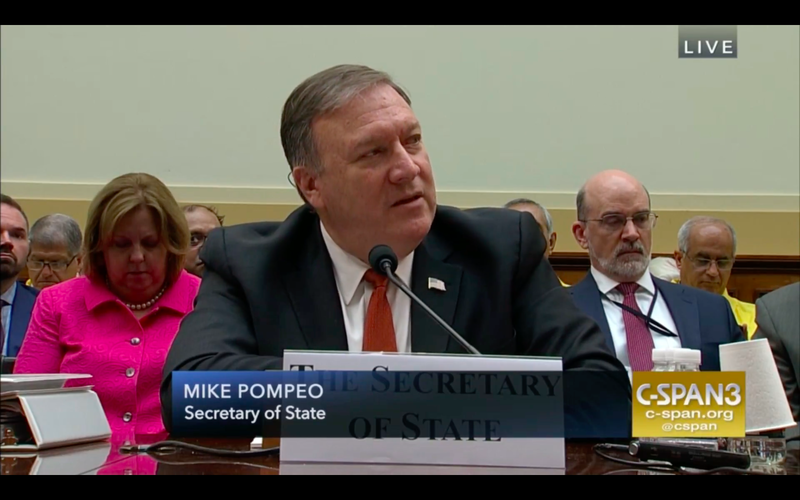 “You know, this term ‘deep state’ has been thrown around — I will say this, the employees that worked for me at the CIA, nearly uniformly, were aimed at achieving the president’s objectives and America’s objectives,” Pompeo responded. “And that’s your experience when you interact with colleagues at the FBI and the Department of Justice as well?” Lieu asked. It was like watching a two-handed puppet show about two swamp monsters furiously agreeing with one another that there is no swamp. This would be the same Mike Pompeo, by the way, who promised that he would make the depraved, lying, torturing, propagandizing, drug trafficking, coup-staging, warmongering CIA into a “much more vicious agency.” The same Mike Pompeo who just the other day stood before a plutocrat-funded DC think tank declaring an effective regime change policy against Iran, citing its government’s human rights violations while ignoring the human rights violations of the Saudi Royals which were making headlines that same day. I hardly ever use the term “deep state” anymore. For a time it was a sensible label to use within smaller, well-informed circles to refer to the unelected power structures which remain in America regardless of the shifting tides of its official elected government, but ever since it became a mainstream household term it’s been rendered meaningless by partisan hackery. Republicans, who spent the last week defending CIA torture as “Bloody Gina” Haspel ascended to Pompeo’s old office, insist that President Trump is “fighting the deep state” due to some shady intelligence community behavior two years ago. This would be the same President Trump who has authorized unprecedented black budget funding for that same intelligence community. The same President Trump who has advanced longstanding deep state agendas against Syria, Iran and Russia, the same President Trump who has continued Bush and Obama’s Orwellian surveillance program, government opacity and persecution of whistleblowers, the same President Trump who said he supports the US Department of Justice in its prioritizing the arrest of WikiLeaks editor-in-chief Julian Assange. Democrats meanwhile proclaim that talk of a deep state in America is a baseless conspiracy theory, which is an innately absurd position. Deep state is not a conspiracy theory, it’s a concept used in political analysis to describe the ways that unelected power structures like multinational plutocrats and intelligence/defense agencies tend to collaborate with one another in order to advance their own agendas. The fact that such plutocrats and agencies (A) exist, (B) have power, (C) are unelected, (D) tend to form alliances with each other and (E) try to advance their own agendas is not disputable; the only thing you can dispute is the nature and extent of their operations. These would be the same Democrats, by the way, who have spent the last year and a half fanatically defending US intelligence agencies and canonizing J Edgar Hoover heirs James Comey and Robert Mueller as living saints. Obviously there is a deep state in America, obviously it is extremely powerful, and obviously men like Donald Trump and Mike Pompeo are some of its most valuable foot soldiers. But partisan echo chambers have most Americans so blinkered that they can only see one of two halves of the equation: either the US intelligence community is a plucky band of virtuous patriots resisting a president who is simultaneously (A) stupid, (B) crazy, (C) a Nazi, and (D) a Kremlin agent, or Trump is a populist hero of the people who is fighting the deep state. Through the filters of partisan idiocy it’s impossible to see the otherwise obvious fact that unelected power dominates the United States, and that Donald Trump is in full service of that unelected power. But more and more people are seeing through the illusion. More and more are asking the right questions about why US presidential administrations seem to advance more or less the same policies regardless of political affiliations. It isn’t necessary to use the now-useless phrase “deep state” to point to these dynamics. They’re becoming more and more self-evident by the day.